Be the first to share your favorite memory, photo or story of Elizabeth "Betsy". This memorial page is dedicated for family, friends and future generations to celebrate the life of their loved one. 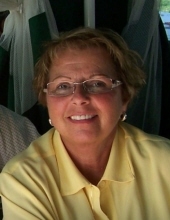 CLARK, Elizabeth Layne "Betsy" Age 67, of Fenton, passed away peacefully on Friday, November 23, 2018. A memorial visitation will be held at Sharp Funeral Homes, Fenton Chapel, 1000 Silver Lake Road, Fenton from 1-4 and 6-8 PM Friday, November 30th. Those desiring may make contributions to the Pancreatic Cancer Action Network (PanCAN). Betsy was born July 3, 1951 in Manistique, the daughter of Raymond and Peggy (Tatrow) Harris. She was a 1969 graduate of Fenton High School. She had resided in Fenton for most of her life. Betsy was retired and loved to garden and take her friends and family out on her pontoon boat on Lake Ponemah. Betsy attended St. John the Evangelist Catholic Church. Surviving are: sons, Bobby and wife Kelley Clark of Illinois and Timothy "Tim" Clark of Fenton; brothers, Rocky and wife Kim Harris of Flint, Ronnie and wife Sherry Harris of Flint, and Nathan Harris of Texas; sister, Jennifer and husband David Chambers of Garden; nieces, Keri Allison and Taren Clayton, Grand-dog, Colby, several other nieces and nephews and many special friends. To send flowers or a remembrance gift to the family of Elizabeth "Betsy" Layne Clark, please visit our Tribute Store. "Email Address" would like to share the life celebration of Elizabeth "Betsy" Layne Clark. Click on the "link" to go to share a favorite memory or leave a condolence message for the family.